> A true love of honeybees! Do you love honeybees enough to get a permanent tattoo of one? Well that’s just what one of our customers did! After hearing about our 5 foot wall of live honeybees this bee enthusiast made his way to The Hive Honey Shop in search of his little friends. After enjoying our observation hive he began asking questions about how to take up beekeeping. We told him about our beekeeping courses and showed him around our well stocked library of beekeeping books and DVDs on sale. 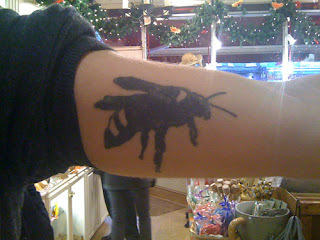 He then spoke of his passion for bees and revealed his enormous honeybee tattoo on his forearm. I have never seen such a detailed bee tattoo before. Million Dollar Question: ‘Did it hurt?’ He just rolled his eyes.